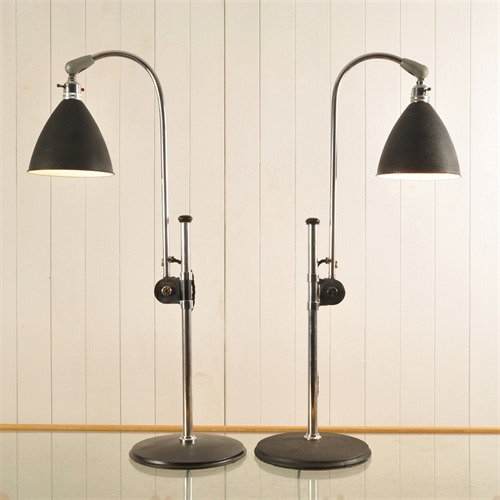 These iconic Bauhaus desk lamps were designed in the 1930's by Robert Dudley Best. Produced in Birmingham these beautiful lights are in fantastic condition with all of the adjusting movements working smoothly. Some patina throughout as per their age. All re-wired and pat tested. These are not quite a pair - you can see in the picture with the arrows pointing out the very subtle differences. We are very proud to have found such a fantastic British design. Famously Winston Churchill had one on his desk in his air-raid shelter under Whitehall. Adjust from 52 - 82 cm h. 15.5 across the shade and 22 across the base.